This bright yellow and brown sunflower plaque with a rusty coating over it will look great hanging on a fence post or garden wall. This lazy frog in blue overhauls with tiny stars cut out will keep the mosquitos away this summer if you place one of your citronella candles under him on your deck, porch or right in the middle of your flower garden. This cactus setting on a stone-like base does not need to be in the desert. Just set it in the gargen with a candle under it and the light will shine through the holes. It also makes a great Cowboy Christmas Tree!! If this Large Bullfrog could croak it would keep you up all night but place your candle or battery operated candle under him and the light will shine brightly on your garden. Additional shipping charges due to oversize package. Touched by the first light of the morning sun the fairies leave traces of magic fairy dust. This whimsical cottage will delight your fairies when added to your fairy garden. 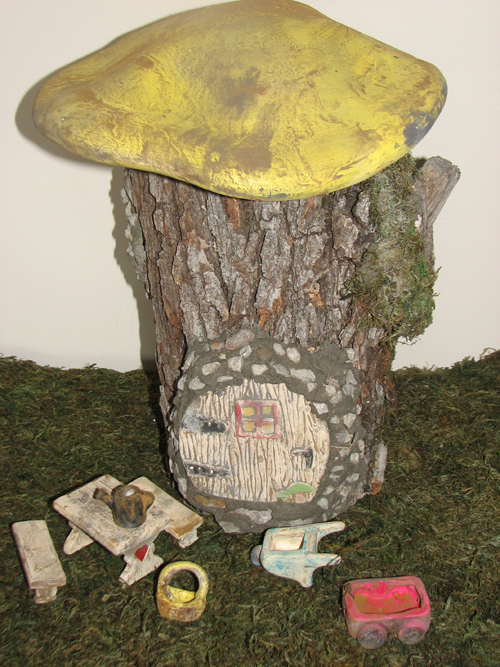 Also we have many original fairy garden accessories that include acorn birdhouse, mail box, fence, doors, dragonfly, ladybug, garden bench, bee hive. Please email for availability. This large gnome is pushing his wheel barrel that you can use as a flower or herb planter. Will come in assorted color we choose but will accept color request. Additional shipping charges will be applied to order due to oversize packing box. Hat is removable and can be customized with your team color! Let heaven and nature sing with this garden angel. Comes in three pieces and halo can double as a candle holder or plant holder. Flowers NOT included. Small Mushroom 8" X 8"
Large Mushroom 12" X 12"
This cute pair will look great among your flowers or garden pond. Sold in a set of two. Fill this frog with water and it will tend to your plants. Fill the spout full of water and turn over and stick into your plant to water. Fill the spout with water and turn over to self water your plant. Comes in pink, orange, green, blue and yellow. Hang in your tree and the birds will be welcomed to your yard. This colorful dragonfly looks great hanging on the side of your fence or wall. Comes in blues, pinks and yellows. This is a hole cutout of the bottom of this bunny so you can place a candle to shine through it's cutout stars. This tree has 50 round holes on the branch tips for you to place your own string of lights inside of the tree for a colorful glow. Change the color of the lights to enjoy all year long! Tree measures approximately 16" Tall.